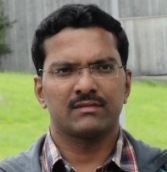 Ramasuri Narayanam joined IBM Research, India as a Researcher in 2010. Prior to joining IBM Research, he received Master's degree and Ph.D. degree both in Computer Science, in 2006 and 2010 respectively, from the Department of Computer Science and Automation, Indian Institute of Science, Bangalore, India. His research interests are social network analysis, game theory, mechanism design, and electronic commerce. He was a recipient of Microsoft Research India Ph.D. fellowship for a duration of 3 years from 2007-2010 and he also received an honorable mention award for his Ph.D. work from Yahoo! Labs Key Scientific Challenges, 2010. He received "The Best Ph.D. Thesis" award from Computer Society of India (CSI), 2012. Synopsis: In this talk, I will first introduce social networks and social network analysis using several real life examples. Then I present key tasks in network analysis and the state-of-the-art for the same. Next I present the challenges involved in conducting the analysis of such network. Finally I present various important techniques that are commonly used to address the tasks in social network analysis. While doing the above, I will cover the classical concepts from network science and sociology as well as the recent advances using graph mining. Synopsis: Networks are prevalent in several real-life scenarios. Graphs are a convenient way to represent such networks wherein we model nodes as entities/individuals in the networks and we model edges as the relationships among these entities/individuals. Often these individuals are autonomous, rational, and intelligent in many practical scenarios. Interactions among such rational and intelligent individuals can be analyzed in a systematic manner using Game Theoretic techniques. We consider several such scenarios that arise in the context of social networks; and present the models and algorithms to address the same. Also, often these algorithms turn out to be computationally hard due to the complex nature of the solution techniques from game theory. For such scenarios, we present approximation algorithms as well as special settings wherein polynomial time algorithms are possible to design. Synopsis: This talk is based on designing game theoretic based methods to rank nodes in social networks. In particular, I present the study on a recently developed centrality metric to identify key players in terrorist organisations due to Lindelauf et al. . This metric, which involves computation of the Shapley value for connectivity games on graphs proposed by Amer and Gimenez , was shown to produce substantially better results than previously used standard centralities. I also present the first computational analysis of this class of coalitional games along with two algorithms for computing Lindelauf et al. 's centrality metric. The first algorithm is exact, and runs in time linear by number of connected subgraphs in the network. The second algorithm is approximate and can be used to study much larger networks.